The story of the Colossus began in 305BC and it was built for the sun God Helios by the Greek architect Charles of Lindos. The Colossus is considered one of the 7 ancient wonders of the world and the statue made from bronze from the island of Rhodes itself. 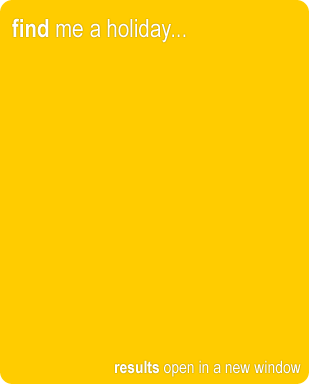 In 305 BC he had his son Demetrius Poliorcetes, also a general, invade Rhodes with an army of 40,000; however, the city was well defended, and Demetrius had to start construction of a number of massive siege towers in order to gain access to the walls. The first tower was mounted on six ships, but these capsized in a storm before they could be used. He tried again with a larger, land-based tower named Helepolis, but the Rhodian defenders stopped this by flooding the land in front of the walls so that the rolling tower could not move. With all the back luck and a lack of progress Demetrius gave up and left Rhodes leaving all the siege equipment behind which the defenders of Rhodes quickly sold for a huge amount of money. With this money they decided t built the Colossus in dedication to their patron God who protected them from the invaders. Due to the time it was built there are varying dispute son where the Colossus actually stood, some people say the colossus stood astride Mandraki harbour, but back then it would of been impossible to build and would have been a very weak statue. The most plausible place that the Colossus could of stood was on the hill behind the town of Rhodes. Here it was easy to build and maintain, and as the Colossus stood at over 30 metres tall it seems to be the most logical explanation for its placement. 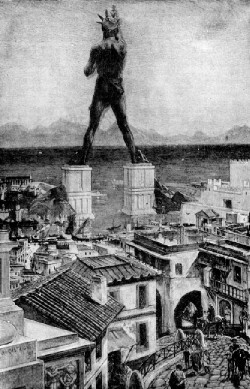 The Colossus was said to have been built with an iron frame and bronze and brass plating. It was built by mounding the earth around the statue as work continued over the years, stones and rocks were filled into the hollow legs to provide stability. Sadly the Colossus doesn't exist in the modern world, it actually stood for 67 years before being destroyed by a terrible earthquake which rocked Rhodes in 226 BC. Its is though that the earthquake would have rocked the rivets and joints in the legs, causing the statue to topple under its own weight and break. Ptolemy III offered to pay for the reconstruction of the statue, but the oracle of Delphi made the Rhodian's afraid that they had offended Helios, and they declined to rebuild it. The ruined statue lay broken but mainly intact for a further 800 years and it was said that few people could even wrap their arms around the statues fingers, this is how big it was. In 654 the Turks captured the island of Rhodes and the leader of the ottoman army had the statue broken up into small pieces and sold as scrap to a Jewish Merchant known as Edassa. This cannot be confirmed and there are many stories and myths to account for the disappearance of this fine and great statue. 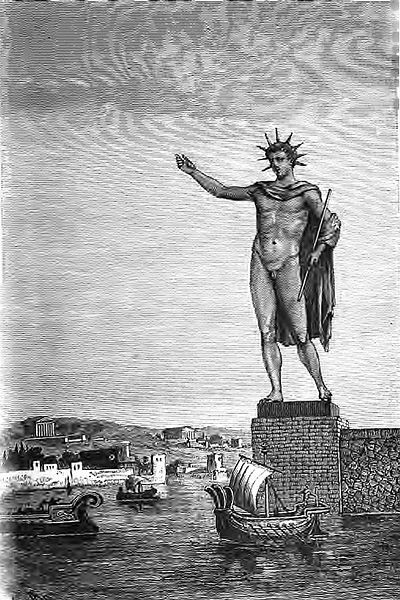 The design, posture and dimensions of the Statue of Liberty in New York Harbour are based on what the Colossus was thought by engineers in the late 19th century to have looked like. There is a famous reference to the Colossus in the poem "The New Colossus" by Emma Lazarus, written in 1883 which sits inside the statue of Liberty. There is much talk of rebuilding the colossus as a tourist attraction which would no doubt be an economic boost for the island of Rhodes but the cost of rebuilding such a giant statue is high. 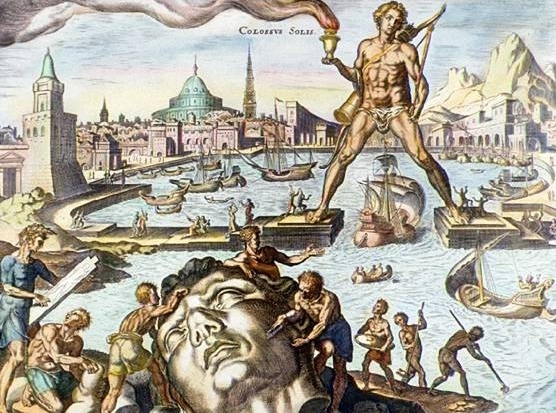 Although as recently as November 2008, it was announced that the Colossus of Rhodes was to be rebuilt. According to Dr. Dimitris Koutoulas, who is heading the project in Greece, rather than reproducing the original Colossus, the new structure will be a, "highly, highly innovative light sculpture, one that will stand between 60 and 100 metres tall so that people can physically enter it." The project is expected to cost up to €200m. The new Colossus will sit on an outer pier in the harbour area of Rhodes, where it will be visible to passing ships. When work begins we will be bringing you pictures and updates of the build.